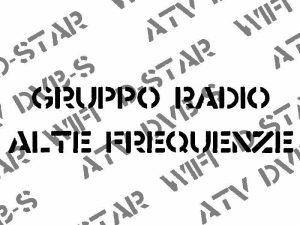 For this purpose i’ve bought a RaspberryPI3, his 10mW output is challenging, extreme qrp, you can set the power to levels ranging from 1 to 10mW, i choose “fullpower” for now, 10mW, and i’ve used WsprryPi program by JamesP6000 to send my whispers on the air. As you can see the result is quite remarkable, best dx was 1821 Km, near Stoccolma, with only 10mW and a longwire as antenna, in temporal order the first who heard my signal was EA1FAQ from Spain, 1299 km away from my QTH. And all this with a simple RaspberryPi connected to my longwire! And look at the Drift column, the Pi3 is rock solid in frequency! (..this thanks to the ntp syncronization used in wsprrypi, i’ve still to try this “rig” with a gps module instead, but i’m quite sure that the results will be the same). You must also provide a lpf for the band you wanna use, because there are consistent generation of armonics upto 500MHz (!!!) clearly visible with my poor rtlsdr receiver. This is a know issue, RaspberryPi isn’t born to be a tx, RF is generated through an hack onto his PWM chip and what you obtain is a square wave output that, as you already know, generates a lot of armonics. I’m using a specific lpf for 30m, bought from qrp-labs, and is working great, but if you have some capacitors and inductors in your shack you can homebrew one easily for your preferred band, the net is full of examples (or you can grab the scheme directly on the qp-labs website). 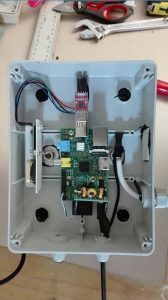 At today, the entire beacon is arranged inside a box, to be honest now we have choose to connect the gps directly on the raspberry gpio, the usb adapter isn’t necessary (so we can gain some mA…). Note: when the raspberry transmits the generated rf make the gps antenna “blind” and you loose the sat’s signal, the possible solutions was to remove the gps from inside the box or to wait two minutes without tx-ing to resync the time…we choose to wait, a single box is more elegant. Look at the necessary low pass filter, as you know raspberry generates a lot of spurious due to the use of square wave, the filter makes a great job, no qrm on the air! 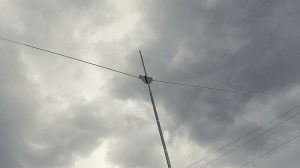 The antenna is a beautiful home made rigid dipole by Silvio IZ5VUQ tuned for 20m with an mfj, and seems to work quite well, in these days we reached Azores (CU2ED 3095km -26db), Canaries (EA8CZI 2898km -21db) and Norway (LA9JO 2932km -22db), not so bad for 10mW, and the beacon is placed at 50m asl. Many thanks to Alf de LA1ZM who kindly send us an email with the reception report, any SWL is welcome too!